In the face of the Trump Administration’s extremist anti-immigrant agenda, Sanctuary in the Streets draws on our ancient traditions to respond with courage, spirit and bold action. Since a family cannot seek Sanctuary in a congregation if their house is raided, we will bring the congregation to them by holding an interfaith service. An internal memo in ICE prevents officers from conducting enforcement in sensitive locations, such as congregations, schools, and hospitals. The interfaith service claims the space as holy ground, as a place of worship, and therefore ICE should not conduct enforcement. An interfaith service also sets the tone of the action as peaceful and prayerful. In this dark time people of faith must increase our light – by lifting up, and living out, our values of love and radical hospitality. Read our 2017 Statement on Sanctuary. We have two raid hotlines that are staffed 24/7: 267-333-9530 (English/Spanish) and 267-345-5248 (English/Indonesian). When immigrants call to report an ICE raid, staff will send an emergency alert to all trained members of Sanctuary in the Streets and activate our raid response system. For more information, please email maria@www.sanctuaryphiladelphia.org. Sign up for a future Sanctuary in the Streets training. Prayerfully disrupt raids – we will bring our presence, songs, prayers, and bodies to peacefully and prayerfully disrupt a raid. Put public pressure on ICE and the Trump Administration to stop all raids and deportations. These raids violate our values and we will not stand silent when ICE comes into a neighborhood and takes tares apart families. This action will shine a light on raids and uncover the persecution of immigrant communities in the US today. Raids and the threat of raids send a wave of terror through the immigrant community. 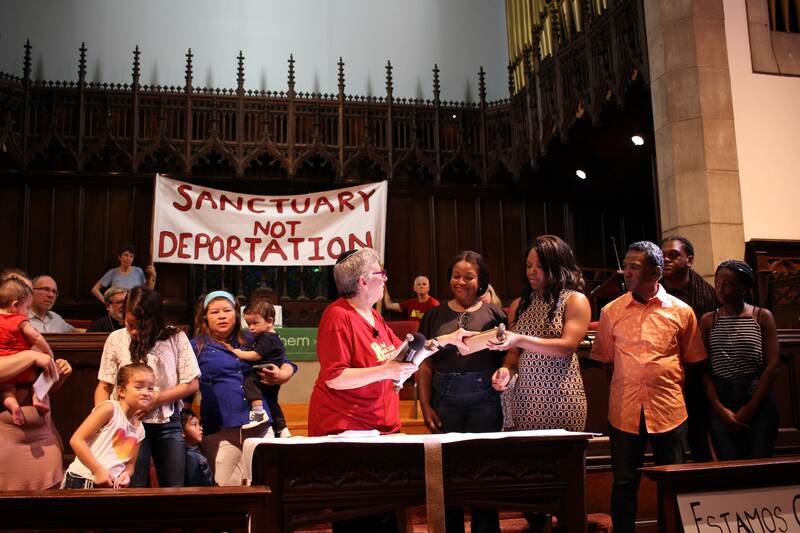 Sanctuary in the Streets counters this with a message of hope, faith and planned action in immigrant communities. See our Sanctuary in the Streets Guide – Feb 2017 for more details.